The team I hate the most. Logically they must be as they destroyed the destiny of the team I loved the most, the 1968 St. Louis Cardinals. If Flood catches that ball in CF, Gibson unquestionably goes down as greater than Koufax, Flood isn't run out of town the next year and St. Louis doesn't go into a 15 year downward spiral. I'll even irrationally blame them for the Carlton-Wise trade. Anyways, part of why I love the launch of MLB Network is that MLB has to fill their programming schedule and that means footage they've been hoarding away is finally seeing the light of day. 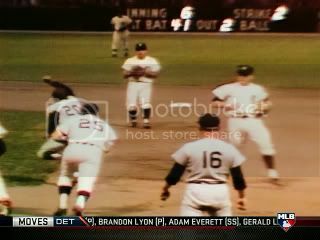 Which brings us to these clips of the 1968 Detroit Tigers. What is most interesting about these is that they are a) in color and b) aren't kinescopes. In fact, they appear to be sourced from tapes. This are the best quality images I've seen from any season before 1969. We have three games and it's time for more detective work. This one was rather simple. The footage included the scoreboard, which shows a Yankees player caught in a rundown. The scoreboard tells us that #41 Jake Gibbs batting. Earlier in the clip we see the batter is lefthanded, which fits Gibbs. It is the 6th inning with 2 outs. I could delve further into when and why it could be but honestly, this one is fairly easy.